The cost of pool fences vary depending on the fence material and type of pool fencing you need. Types of swimming pool fences include decorative fencing, removable fencing or 'invisible' glass fencing. The cost of a new pool fence will also depend on the size and shape of your pool and whether you need professional installation. If you're looking for a new pool fence, there are several factors you should consider when examing the cost of pool fences. First, determine which features you'd like in a pool fence. Are you looking for a pool fence that can be removed during yard clean-up or for a party? If so, you'll want a removable fence. Do you want a permanent pool fence that compliments your home's architecture? An ornamental aluminum fence would likely be the best option for you. Would you rather have a fence that is barely noticeable and that doesn't obstruct the surrounding landscape? If so, you may be interested in a glass pool fence. Once you decide what type of fence you're looking for, compare the price per square foot of each type of fence as well as the associated installation costs. The most popular and affordable type of above ground pool fence is resin fencing. This type of pool fence is lightweight, sturdy and can be easily installed. 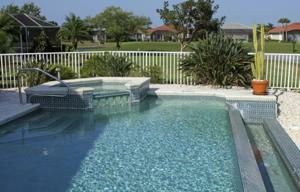 Resin pool fences are often sold in kits, though the modular fence sections can be bought separately. The fence pieces are attached directly to the side of the pool and use the pool's section braces for support. Amount of pool fence sections needed to line the perimeter of the pool. Additional accessories like stairs or gates. One of the most affordable in-ground pool fence options is a removable mesh fence. Prices for removable mesh pool fences vary depending on the type of mesh, the kind of frame poles between the mesh panels and the size of your pool. Mesh pool fence panels range from the most basic to special, tight-woven mesh that can resist mildew or fading due to the sun. The panels are usually priced according to the section's length in feet. Though mesh fences are 'removable,' they must be securely anchored into the ground around the perimeter of the pool. The cost of installation varies. Ornamental aluminum fences are a popular alternative to decorative wrought iron fences as they resist rust. The cost depends on the style, amount of material need and the cost of professional installation. Aluminum fence sections are usually priced per foot or per panel. Pool fences made of glass are the most expensive type of pool fence. In addition to the cost of each toughened glass panel, you'll also need to buy stainless steel spigots, that need to be installed around the perimeter of the pool. These spigots hold the glass in place, for a freestanding look. Glass fences and gates should be professionally installed. Be aware that buying a pool fence may come with additional costs. Whether you're buying a pool fence kit or individual fence sections, remember to figure in the cost of hardware and accessories into your budget. While many types of pool fences can be easily installed, others require professional installation. This is especially true if your pool has an odd shape. Pool fence installation prices vary, so call ahead and get an estimate. Don't forget that your pool's fence will need a gate! The price of a pool gate may be slightly higher that the individual fence sections. No matter what the cost of pool fences, a pool fence that is securely installed is one of the most important investments you'll ever make!